The United States of America, Land of the Free and Home of the Brave, a once “new nation, conceived in liberty, and dedicated to the proposition that all men are created equal,” faces a number of existential threats and many opportunities. The large alligator, approaching my little Sneak Boat on Lake Marion in June 2005, might be an apt metaphor for those threats, not really too serious if I am alert and take the proper actions but otherwise perhaps deadly. 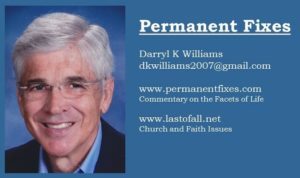 Over the past eight years, since August of 2009, more than 500 posts, on a wide variety of subjects, have accumulated on the PermanentFixes blog. The writing has been a lot of fun and helpful in the process of thought clarification, but the overall result was a big mess with lots of repetition, many dated subjects, many broken links, and no logical order. It seemed that a good next step would be a website combining new posts with edited posts on the same subject, all arranged in some logical order, and leaving behind many unworthy of survival. Just choose a topic from the top of this page for drop down menus leading to essays on a broad range of subjects. The plan is to get everything worthy of updating moved to this website over the next few months. I have always said that my blogs were created so my grandchildren will know what I was thinking and will be able to figure out whether I was right or not. Maybe this will help them be able to do that. And here is a link to the first post in this blog: Cornelius Vanderbilt – New Biography by T. J. Stiles.